Apparently even President Obama knows that New York City is a great place to shop. During a trip to the Big Apple today, the president made a surprise stop at the Gap. Obama checked out some khakis and sweatshirts. A cheery saleswoman talked him through a few options, including a V-neck pink sweater. Obama said he was worried the V-neck would “slip” off his daughter’s shoulders. He ultimately settled on a light pink crewneck for Sasha and a bright pink one for Malia. A White House official explained the president’s impromptu stop: “In his State of the Union address, the President called for businesses to raise workers’ wages, and today the President will visit a Gap store to show his support for Gap Inc.’s decision to increase wages for their US based employees.” During his visit to the store, Obama also picked out navy blue zip-up workout shirtfor the first lady. The president then greeted the woman behind the counter, who told him he was better looking in person. “You hear that?” The president said to reporters. “I think the ladies will be impressed with my style sense,” the president said as his items were rung up. Streaming has started at KWWL, so tune in now! Pool report: Presidential motorcade left a soggy South Lawn at 12:45 p.m. for shopping and lunch. Fourteen minutes later the motorcade arrived at Potomac Yards in Alexandria, where the President headed into the Pet Smart store. By the time the pool was allowed in a shirtsleeved POTUS was at a checkout counter with Bo, who appeared to be sizing up a small brown “standard poodle” named Cinnamon, according to the dog’s owner. “Okay, Bo, don’t get too personal here,” POTUS admonished, holding tightly to Bo’s leash. He pulled out a $50 bill to pay for two items, one a large dog bone. Total was slightly more than $41. After a quick stroll POTUS entered the nearby Best Buy at 1:10 p.m. “This (stop) for the girls now,” he said as he went in. After a round of handshaking he headed straight to the Wii section, where he bought a Just Dance game for his daughters. He also bought a pair of $50 iTunes gift cards and an unidentified game. Tab came to 194.48. “Let’s see if my credit card still works,” he said. It did. Pool ushered out. Minutes later POTUS emerged with three large pizzas. Then he worked the crowd on all four corners of the intersection plus a fifth cluster of squealing well-wishers a bit further down Del Ray. Motorcade including Bo rolling at 1:48, arriving South Lawn 2:05 p.m.
President Obama and his dog Bo with a poodle named Cinnamon as they check out at PetSmart in Alexandria, Va. Obama bought the presidential pup a toy bone and a bag of food while Bo played in the store with Cinnamon. Washington Post: ….. President Obama and first lady Michelle Obama, pulled up to a roadside farmer’s market in their imposing Ground Force One presidential bus for a little pumpkin shopping. …. 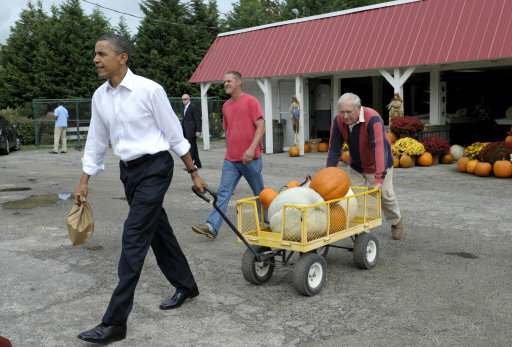 As Obama talked to the shopkeepers, the first lady was busy inspecting pumpkins. She seemed very interested in oversized white-colored ones, which Betty Wood later explained were called “full moon pumpkins.” Michelle Obama picked one up by wrapping both arms around it to load it into a metal rolling cart with a long metal handle. Betty Wood later estimated the pumpkin could weigh 70 pounds. “No, we’ll have enough trouble getting these back,” she said.